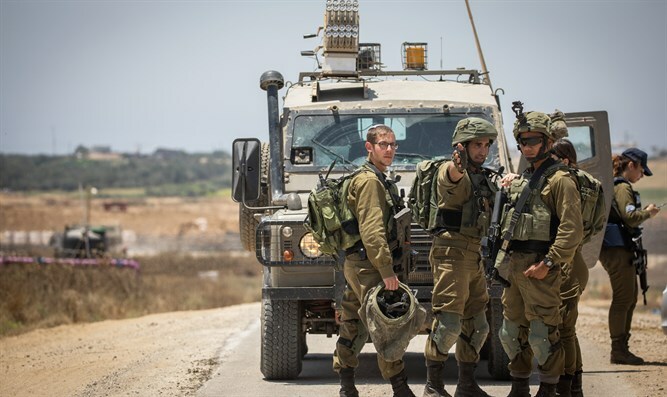 In light of recent statements by the Hamas terrorist organization, and the identification of the evacuation of Hamas posts, the IDF Southern Command decided to reinforce the Gaza Division and close several access routes in the area adjacent to the Gaza Strip. There are no further instructions to the public. The IDF stated that it operates in order to ensure the security of civilians in the area, and will not tolerate any aggression against Israeli civilians or IDF soldiers, and is prepared for a wide variety of scenarios. Hamas released a statement in response to an Israeli airstrike which killed two terrorists Tuesday afternoon In the statement, Hamas warned that "Israel will not be able to sleep at night. Their attack will not pass without them paying a price." Earlier on Tuesday, Gaza terrorists fired at IDF soldiers stationed near northern Gaza. In response, the IDF targeted the Hamas post from which the shots were fired, eliminating two Hamas terrorists. However, reports are circulating about a possible ceasefire between Hamas and Israel. On Monday, London's Asharq Al-Awsat claimed that Hamas had agreed to a "gradual ceasefire" in exchange for Israel reopening the Kerem Shalom crossing. On Tuesday, Israel Hayom reported that internal disagreements between the Arabs and within Hamas itself may cause the Egyptian efforts to fail.